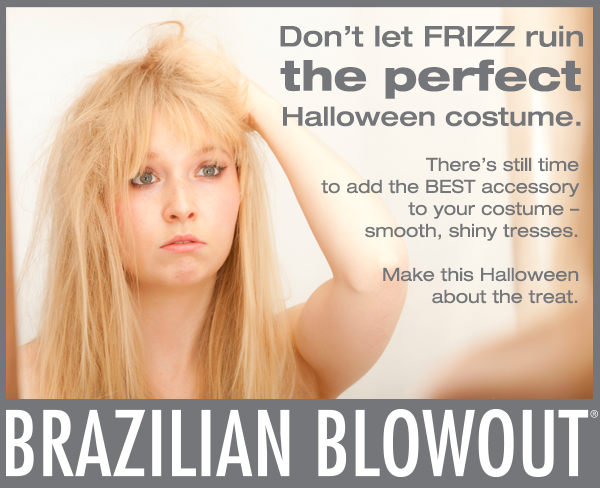 Brazilian Blowout Blog: Don’t Let Frizz Ruin Your Halloween! This Halloween, don’t let a bad hair day ruin your costume. Now is the perfect time to treat yourself to a Brazilian Blowout and banish scary frizzies and flyaways! With temperatures dropping, it’s time to tame those tresses and get your hair in shape for the dry, chilly days ahead. You want to be noticed for your ensemble, not your frizzy mane! By utilizing the Brazilian Super Nutrient Complex, a Brazilian Blowout smoothing treatment will improve the overall health of hair by creating a protein layer around each strand, eliminating frizz, smoothing the cuticle, leaving you with incredible healthy, radiant, shiny hair. Oh, and the perfect accessory for any Halloween get up. Whether you’re going as a Frozen character, Katniss, some sort of animal or what-not, make sure you put your best accessory forward...your hair! Brazilian Blowout is an incredible treat with results that will last up to 12 weeks! Momina Mustehsan Fan Club This is really great work. Thank you for sharing such a useful information here in the blog. Writing a Legal Case Study Things are very open and intensely clear explanation of issues. was truly information. Your website is very beneficial. Finance Dissertation Help This a good way to appreciate the teacher as they put their efforts to train students. UK dissertation Writers appreciates the teachers. Hi! Visit this page for more interesting information! Don't let them ruin your career! Order a custom writing essay now here https://samedaypaper.org/blog/argumentative-essay-writer. Trust me!